For the period of April 2017 to August 2017, the GOJ reported Total Revenues & Grants of $213.07 billion, $14.62 billion more than the government’s projection. Furthermore, year over year, this represents an increase of approximately 11.9% relative to the $190.43 billion recorded for the corresponding period in 2016. ‘Tax Revenue,’ ‘Non-Tax Revenue,’ ‘Capital Revenue’ and ‘Grants’ outperformed projections while ‘Bauxite Levy’ underperformed projections during the review period. ‘Tax Revenues’ amounted to $193.97 billion, $11.01 billion more than budgeted, ‘Non-Tax Revenue’ of $16.31 billion was reported; $3.05 billion more than budgeted. ‘Grants’ totalled $2.01 billion, $220.9 million or 12.4% more than budgeted. In addition, “Bauxite Levy” closed at $127.5 million, relative to the budgeted figure of $131.0 million, while ‘Capital Revenues’ outperformed projections by $345.7 million to total $652.7 million. Total Expenditure for the period April to August 2017 amounted to $218.90 billion, $6.89 billion or 3.1% less than the budgeted $225.8 billion. Recurrent expenditure which totalled $205.3 billion, accounted for 94% of overall expenditures. Relative to projections, recurrent expenditure was $6.79 billion (3.2%) less than budgeted. Of the recurrent expenditure categories over the review period, ‘Compensation of Employees’ came in above budget by $499.3 million, totalling $79.25 billion relative to a budget of $78.75 billion. ‘Employee Contribution’ which amounted to $6.72 billion, was $846.5 million less than projected, while ‘Wages and Salaries’ was below the projection by $347.2 million to total $72.53 billion. ‘Interest’ closed the period under budget by 3.4%, while ‘Programmes’ was under budget by 7.2%. ‘Capital Expenditure’ amounted to $13.60 billion for the period and was under budget by 0.7% relative to the budgeted $13.71 billion. 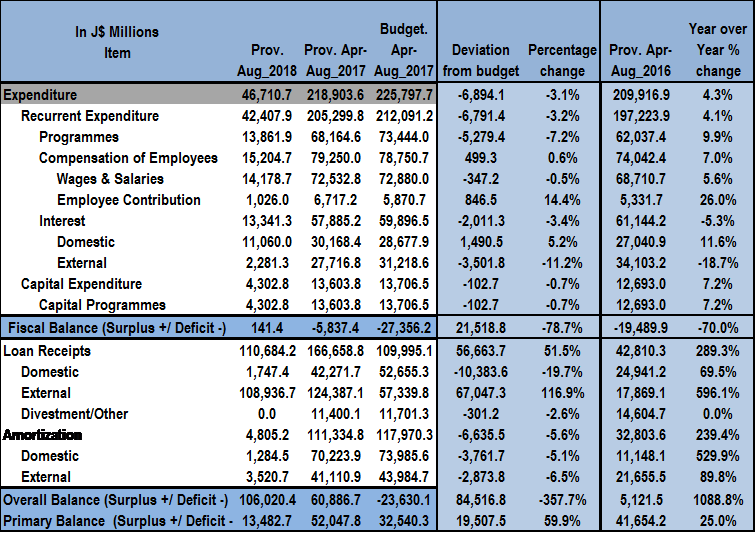 As a result of the decrease in expenditures for the period April to August 2017, the ‘Fiscal Deficit’ was $5.84 billion, relative to a projected deficit of $27.36 billion. Additionally, the primary balance for the period amounted to $52.05 billion, 59.9% more than budgeted. As part of the Memorandum of Economic and Financial Policies (MEFP), the GOJ estimates that the primary balance, as a performance criterion, should amount to $131.9 billion by the end of the 2017/2018 fiscal year. For the September quarter, a primary balance of $38.1 billion is estimated. As at August 2017, this amounted to $52.05 billion. Tax Revenue is expected to total an estimated $218.0 billion by the end of the September quarter, as at August 2017, tax revenue was booked at $193.97 billion.